WEST LOOP — Dozens of buildings along major stretches of Randolph Street and Fulton Market — including ones that house some of the city's best-known restaurants — would become part of a historic district under a city proposal that the Commission on Chicago Landmarks will consider Thursday. The proposal — presented at a community meeting Tuesday night — calls for granting historic designation to a six-block stretch of buildings on Randolph between the Kennedy Expy. and a property just west of Carpenter Street and along Lake Street from Peoria to Morgan streets. 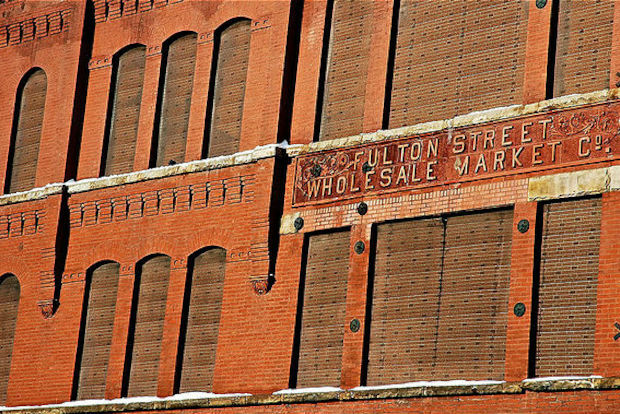 An eight-block stretch on Fulton Market between Halsted Street and Racine Avenue would also be landmarked. The 75 buildings that would be affected by the historic designation currently house restaurants including the Girl and the Goat and the Publican and multiple restaurant supply businesses and butchers. The proposed historic district is part of a larger land-use plan that would regulate building construction and designs in the area and also bring streetscaping and other improvements to create a "distinct sense of place," documents say. At Tuesday's meeting, Eleanor Gorski, director of Chicago Landmarks and Historic Preservation, said the landmarking would focus more on preserving those buildings' exteriors with the opportunity for additions to the existing structures. The proposal recommends virtually eliminating residential zoning along Fulton Market from Halsted Street west to Ogden Avenue, but also pushes large-scale business and residential zoning (with the potential for 15-story buildings) along the new Morgan Street "L" stop, from Halsted Street west to Racine Avenue. The city would also invest in a "facility to promote and market regional food." Details on that proposal were not immediately available. The city has been developing the proposal over the last year partly in response to a recent development boom in the West Loop, city officials said. The proposal stated the plan would help preserve "an area of historic buildings occupied by new and traditional food business that showcase Chicago as the culinary epicenter of the Midwest." It's also an area that "has attracted innovative industries" — including Google — which the city believes will continue. "There's going to be a lot more developer interest in that community," said Pete Strazzabosco, a spokesman for the Department of Buildings. The proposal "can really help the area support the uniqueness of the area without allowing it to fall victim to its own success." The move would bring tax credits, permit fee waivers and potential TIF money for businesses seeking to move to the area or develop buildings there, many of which are rundown and date to the late 1800s and early 1900s. Tuesday night's community meeting at Venue One, 1044 W. Randolph St., drew more than 200 residents and area business owners. Many seemed concerned about the project's relatively short timeline. Some, like developer Thomas Comforte, were concerned that the plan encroached on an already naturally successful district. "Do not allow the city to dictate what you will do with your land," said Comforte, who said he was especially concerned about the lack of proposed housing along Fulton Market. "This plan, for me, does not work," Comforte said. Residents and business owners are encouraged to submit their own recommendations for the historic district before Thursday's commission meeting at 12:45 p.m. at City Hall, 121 N. LaSalle St., Strazzabosco said. He said there would "absolutely" be enough time to incorporate resident and business feedback before that meeting Thursday. But some area building owners have concerns about the proposal, said Armando Chacon, president of the West Central Association. "It really reinforces my concerns about this getting pushed through too quickly," Chacon said Tuesday. "If you want to keep the character of the area, the design guidelines would make a lot of sense. But to landmark the buildings, I’m not sure I agree with it."